The Arizona-Mexico Commission’s (AMC) binational committees have been hard at work this month, working for collaborative ideas and solutions that will strengthen our region. Governor Ducey has set an ambitious vision for the committees in partnership with Sonora Governor Claudia Pavlovich - a vision that is producing real results with lasting impacts. Just last week, the Arizona and Sonora leadership of our committees came together at the AMC Inter-Plenary Session to set goals and develop their work plans leading into the June 2018 AMC Summit. More than 120 Arizona and Sonora leaders attended the meeting, continuing their work to increase competitiveness and quality of life across the region by strengthen the ties between our states and countries. This kind of collaborative cross-border work is what has fueled the AMC’s proven legacy for nearly 60-years and it’s what continues to strengthen the business and cultural ties between our states. Learn more about some of the recent committee activity below. Earlier this month, the Arizona-Mexico Commission came together with the Arizona Commerce Authority (ACA) and our partners in Sonora to kick-off the inaugural Arizona-Sonora Business Expo. The two-day event drew nearly 100 exhibitors and 2,300 participants all working together to facilitate new connections, increase cross-border collaboration and strengthen an already prosperous relationship between Arizona and Sonora. The inaugural Business Expo resulted from a joint agreement between Governor Doug Ducey and Sonora Governor Claudia Pavlovich to promote Arizona and Sonora as a premier location to do business. Led by the Arizona-Mexico Commission/Comisión Sonora-Arizona binational Economic Development Committee, the Business Expo worked to bring together leaders from all sectors of business, focusing on the region's incredible strategic advantage for companies when it comes to trade, investment and economic development. Click here to learn more. The Lukeville-Rocky Point Safety Corridor launched earlier this month, as a result of a joint agreement between Governor Doug Ducey and Sonora Governor Claudia Pavlovich signed at the December 2017 Summit in Rocky Point. The effort was led by the Arizona Department of Transportation (ADOT) through the AMC’s Transportation, Infrastructure and Ports Committee and brought together all the right players including the AMC's Tourism, Security and Health Services Committees along with our partners in Sonora with the goal of offering a safer path to the Rocky Point from Arizona. The safety corridor aims to streamline emergency medical services in the 63-mile corridor and increase patrol and accident prevention efforts. The effort also includes comprehensive training programs for Sonoran first responders and an information sharing element that offers drivers important information about delays, accidents, and more through the Arizona 511 system. Click here to learn more. Last week, the AMC joined the Arizona Commerce Authority (ACA) Office of Film at the annual Tucson Cine Mexico Film Festival Opening Night Reception and screening of the documentary, Etiqueta no Rigurosa. As part of the event, the AMC continues to support the Economic Development Committee's work to promote cinematic opportunities in Arizona and Sonora. The ACA actively works to promote the Arizona-Sonora region as one that offers it all, from the high desert in northern Arizona to the beaches in Rocky Point. Tucson Cine Mexico is the longest-running festival of contemporary Mexican film in the United States, and Cine Mexico is co-presented by the University of Arizona’s Hanson Film Institute and Cinema Tropical, a nonprofit dedicated to the distribution of Latin American cinema in the United States. The AMC Energy Committee Co-Chairs and Delegates came together earlier this month for a day of information sharing between Arizona and Sonora on energy infrastructure project that support Arizona’s energy needs. 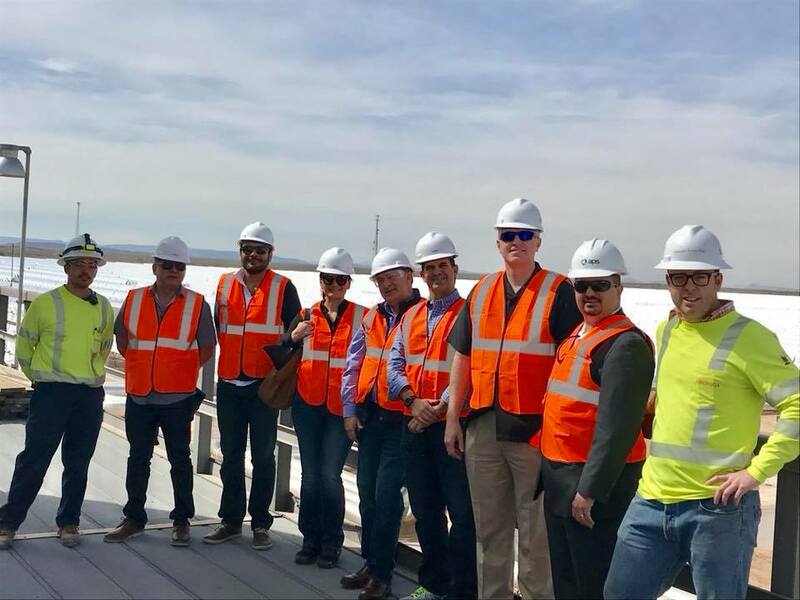 The day-long event hosted by APS and SRP included tours of the Solana Generating Station, the largest parabolic trough plant in the world located 70-miles southwest of Phoenix, near Gila Bend, Arizona. The meeting supports the work of the AMC Energy Committee to share information on best practices for energy production and the development of long term cross-border energy generation and distribution. The AMC thanks APS and SRP for hosting the tour for our partners in Sonora!